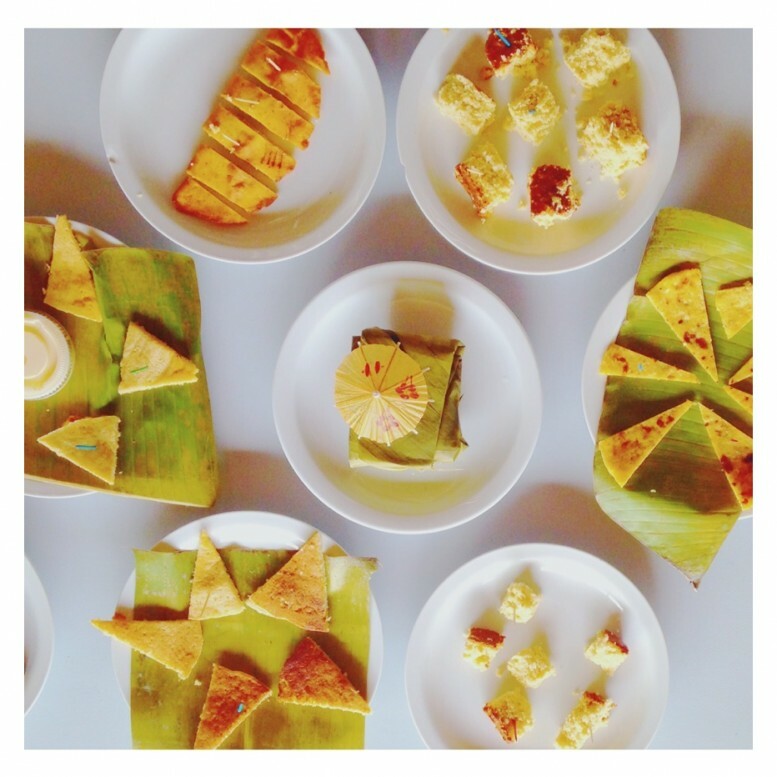 We loaded our plates with fresh empañadas, cheesy tortillas and sweet chorreadas, unwrapping huge banana leaves to reveal steaming tamales filled with veggies and meat. We ohhed, ahhed and salivated over the tamal asado, a sticky sweet cornbread that frankly put me over the edge of satisfied, too full to try any more typical Costa Rican dishes made from maize, the star ingredient in this Tuesday tasting class. When we look at any Costa Rican table today, chances are at least one thing on it was born of corn, that versatile staple vital to life all over the Americas since time immemorial. If we were to dig in the gooey sediment of Guanacaste lakes, we would uncover 5,000 year old maize pollens. If we dove to the bottom of Arenal Lagoon, we might resurface with charred cobs from 2000 BC. But even as technology like carbon-dating and genetic sequencing shuck the history of modern maize, its origins remain mysterious and its future uncertain. 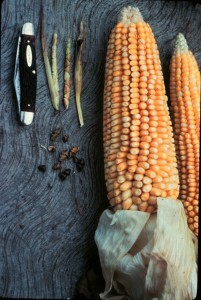 Modern corn with its diminutive ancestor, teosinte. Most scholars agree maize was domesticated between 7,500 and 12,000 years ago in Mexico. Its nearest wild relative is a grass species called teosinte, in which each teeny tiny kernel is enclosed in a hard shell. It remains unclear how prehistoric Americans managed to cultivate the starchy stuff of tamales from this unpromising ancestor, itself barely a mouthful, hardly worth the effort for even the most industrious omnivore. Mankind’s unlikely mastery of maize has far from run its course. In 2013, some 32 percent of corn grown in the entire world was genetically modified in some way, meaning it contained genes that were altered by humans with the intention of making the crop more productive, resistent to drought, bugs and blights, or some combination of these. About 90 percent of corn grown in the United States that year came from GM seeds, which are typically patented by the multinational corporations that developed them. Because of patents, farmers can not legally use GM seeds without buying new ones every single season. For example, Monsanto, one of the world’s biggest and most profitable GMO producers, pursued 145 lawsuits relating to patent control between 1997 and 2012. We need not root around very long to get an earful about GMOs. Many say patent laws foster monopolies that put small farmers out of business while monocultures (single crop plantations) are underming soil longevity and overall ecosystem health as they wreak unintended havoc on human health, too. Others say that GMOs are a necessary innovation in agriculture, one that allows us to use less while producing more, developed in response to ballooning populations and dwindling water supplies. The debate over GM corn is a fiery one in a country where extensive agriculture and extremely high biological diversity coexist. Currently, Costa Rica does not produce GM corn, (however, GM cotton, soybeans, pineapple and banana plots are grown here). This exclusion could change soon. In Jan. 2013 a subsidiary of Monsanto gained approval from Costa Rica’s National Biosecurity Technical Commission to grow corn, sparking mass protests and a legal appeal, which put the project on hold until Costa Rica’s Supreme Court reviews its constitutionality. By 2013, 66 out of 82 cantons in Costa Rica had passed laws prohibiting GMOs in some way. Still, no national law backs this popular majority and GMO projects are ultimately approved or denied by the feds on a case by case basis. The introduction of GM corn is especially high stakes because unlike soybeans and cotton, corn pollinates on the whims of the wind. Many believe GM seeds will contaminate native fields and make it very difficult for farmers to grow heritage crops. But when I bit into the chorreadas at Tuesday’s class, I tasted neither the history of civilization nor its fate, just the indescribable sweetness of American corn, smothered in sour cream.